Is there a website or contact details to order some samples? I have based and undercoated the figures I received today and when there is some decent light for pics I will post photos. He does have a web site but these figures are not up on it at the moment. However you can use the contact details on that web site to email him and use the list I have posted here to order from. He seems to have cast cast mine to order. I don't think it is a full blown commercial range at the moment but he does seem willingto accept orders if you can track him down. The Arabs seem to be bulkier than the FFL with the exception of a couple of the French figures which are built on a larger scale. Most of the figures come with seperate packs so you can choose to have them in marching order or fighting trim. The figures I got are nicely cast and only one code (F6 I think) showed any flash. They are nice figures and so long as they are the right size for you I would recommend them - I'm very pleased to have finally tracked them down and got the additional figures I wanted. what is the website address, please? 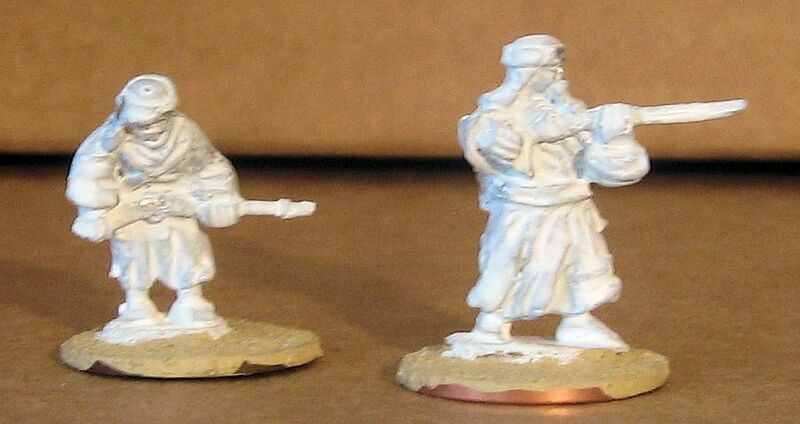 I've based all my figures on pennies, basetexed and white undercoated them. In the pictures below I have tried to list them in numerical order, if you check them against the listing I posted before. I'm not 100% sure I have identified them all correctly. There are a few extra unlisted figures (all foot) - the Arab ones are in a separate photo, the FFL ones on the right of the photo. In general the Arabs seem a bit bulkier than the FFL, apart from a couple of the FFL figures, particularly F6 Marching Shouldered Rifle Classic Pose. I'm glad to have finally tracked these down, they are nicely designed and cast figures. They will be going into my interwar setup. The range seems to have been named Battlepac. Great post Kalinovsky, really useful photos. 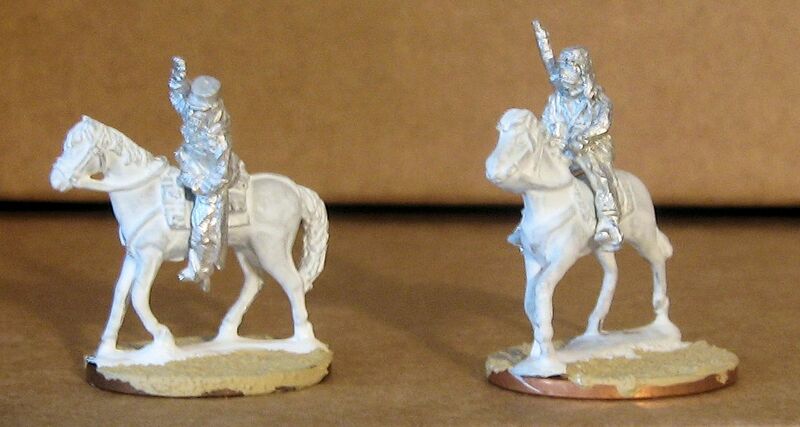 the mounted figures look really good as do the foot Foreign Legion; the flowing clothes / coat (thawb / possibly djellaba too in Morrocans) of the "Arabs" could make them bulkier figures to model? And the poses though varied look less useful on first sight. But I shall order some to see! Great bit of detective and photo review work Kalinovsky. Thanks. Might be my eyesight or just old pc but I found the list that Kalinovsky posted hard to read so I re-typed it in larger script and hopefully it will post here to help others with poorer sight (like me). UK postage if the order is under ten pounds then 70p postage; if more [order over ten pounds I assume] then its free in the UK. So provides some interesting figures for early 20th century colonial warfare in Morocco, and Algeria.